Introduction: Intraoperative trans-esophageal echocardiography (TEE) has been found to underestimate severity of aortic stenosis (AS) compared to trans-thoracic echo (TTE). We conducted a prospective study comparing pre induction TTE and intra operative TEE grading of AS in patients posted for aortic valve replacement surgeries. Methods: Sixty patients with isolated AS who were undergoing aortic valve replacement were enrolled in our study. Baseline TTE was done and after induction of anesthesia, TEE was done. Mean gradient across aortic valve, peak jet velocity, aortic valve area (AVA) by continuity equation and dimensionless index (DI) were assessed in both. Results: Mean gradient decreased from 56.4 in TTE to 39.8 mm Hg in TEE leading to underestimation of AS in 74.5% of patients (P < 0.0). Mean of peak jet velocity also decreased from 500 in TTE to 386cm/s in TEE (P <	0.01). In 76 % of patients this led to reduction of AS grade from severe to moderate. Mean AVA was 0.67 cm2 in TTE and 0.69 cm2 in TEE. Though there was 0.02 cm2 increase, it was not statistically significant (P = 0.07). All the patients remained as severe AS in TEE. DI mean was 0.19 in both TTE and TEE (P = 0.14).It led to underestimation of severity in 6% of patients in TEE. Conclusion: Our study shows that AVA measurement by continuity equation and DI are reliable in grading aortic stenosis while performing intraoperative TEE. Mean gradient and jet velocity can be significantly reduced. Intraoperative transesophageal echocardiography (TEE) has emerged as an invaluable tool in cardiac surgery and catheterization laboratories. Practice guidelines issued by the American Society of Anesthesiologists and the Society of Cardiovascular Anesthesiologists Task Force recommend that TEE should be used in all open heart and thoracic aortic surgical procedures and should be considered in coronary bypass graft surgeries (CABG). In a study done on 1011 patients, abnormal findings were found during intraoperative TEE in 11.4%, and surgical decision was influenced in total 5.8% of cases. It has been found that 3.3% of patients had an unplanned aortic or mitral valve procedure added to the surgery based on intraoperative TEE findings. Aortic stenosis (AS) is the third-most common valvular heart disease with a prevalence of 7.3%. Severe AS is usually defined by echocardiography as mean gradient (PGm) >40 mmHg, aortic valve area (AVA) <1 cm2, and peak velocity of aortic valve jet >4 m/s. Discrepancies are frequently observed in grading severity of AS using above parameters between transthoracic and TEE imaging. 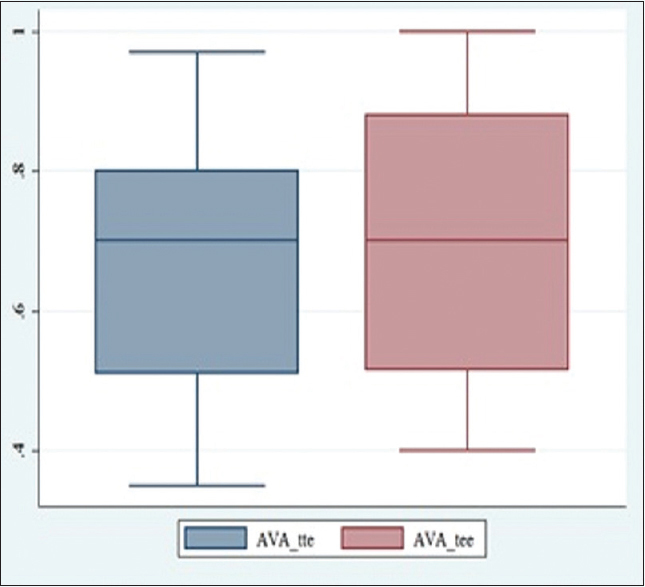 In a retrospective, observational study preoperative TTE PGm and AVA values were compared with precardiopulmonary bypass (CPB) TEE, and it was found that preCPB TEE often underestimates AS severity. The reason for this disparity is unclear. One of the reasons might be that AS grading was originally defined in spontaneously breathing patients. 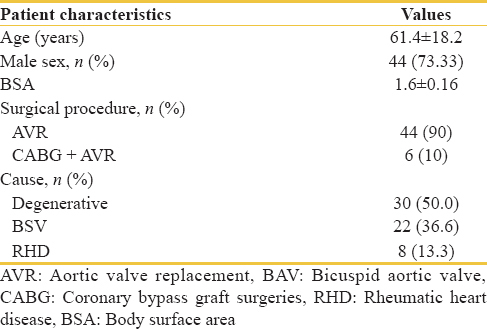 With these concerns in mind, we conducted a prospective study wherein, preinduction transthoracic and postinduction TEE examination was compared in patients undergoing elective aortic valve replacement (AVR) surgery with documented severe AS. PGm across valve, peak velocity of aortic valve jet, AVA, and dimensionless index (DI) were used in our study to grade AS and look for any possible disparity. Institutional Ethical Committee approval was obtained, and a prospective observational study was conducted in our institute between January 2017 and December 2017. Informed written consent was taken, and 60 patients posted with severe AS for elective AVR or CABG with AVR were enrolled in our study. The study included patients between 18 and 80 years of age posted for elective AVR or AVR with CABG with documented severe AS in normal sinus rhythm and normal left ventricular systolic function left ventricular ejection fraction (LVEF) >60% by modified Simpson's method). Exclusion criteria included moderate-severe aortic regurgitation, moderate-severe mitral stenosis/regurgitation, paradoxical low flow, low-gradient AS with normal LVEF, hemodynamic instability, patients with contraindication to TEE probe placement, and patients with poor TTE window. Transthoracic echocardiographic imaging – TTE was done by Phillips S5-1 probe. Images were recorded after shifting the patient to the operating room before induction of anesthesia. Baseline heart rate (HR) and arterial blood pressure (BP) were recorded. The following parameters were assessed. PGm obtained by integrating a continuous-wave Doppler (CWD) tracing of flow across the aortic valve. Apical (5-chamber view), suprasternal, or right parasternal views were used to align sample volume parallel to blood flow with <15° deviation. To determine the cross-sectional area (CSA) of the left ventricular outflow tract (LVOT), the LVOT diameter was obtained using the parasternal long-axis view. LVOT diameters obtained within 0.5–1.0 cm of the valve orifice at the location of the LVOT. CSA was estimated using the formula: CSA = π (d/2) 2, where d is the LVOT diameter. Velocity time integrals (VTIs) of the LVOT and AVA measured through pulsed-wave Doppler (PWD) and CWD, respectively. DI was obtained by dividing LVOT VTI by AV VTI. Transesophageal imaging – Same anesthetist performed TEE after induction of anesthesia when HR and BP were within 20% of baseline. Phillips X7-2t probe was used. PGm across aortic valve, peak velocity, AVA, and DI were assessed as mentioned earlier. CWD and PWD across aortic valve and LVOT, respectively, were assessed in either the deep transgastric aortic valve long-axis view or the transgastric long-axis view. LVOT diameter was measured in mid esophageal aortic valve long-axis view. All patients received tablet diazepam 0.1 mg/kg night before and day of surgery. Standard anesthesia induction was with injection fentanyl 2 μg/kg, injection etomidate 0.3 mg/kg, and injection rocuronium 0.1 mg/kg. Maintenance was with sevoflurane and injection vecuronium and injection fentanyl bolus. Ventilated with oxygen air mixture with FiO2 50%, tidal volume 8 ml/kg, peak end-expiratory pressure 5 cm water, and respiratory rate 14/min. Based on the study, conducted by Whitener et al., considering average PGm as 46.0 in pre-induction TTE group and as 39.6 in pre-CPB TEE, with power as 90% and α error as 5%, sample size of 54 patients was derived. Thus, we decided to enroll 60 patients in our study with 30 in each group. Data were analyzed using STATA/IC (Stata Statistical Software, TX, Statcorp LP) 14.2 software. Data were presented as mean (standard deviation) and frequency percentage. 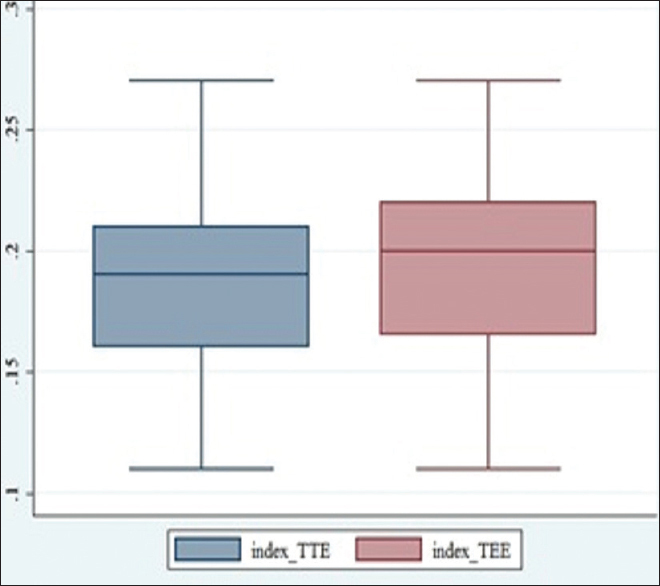 Changes within the variables between TTE and TEE were measured by paired t-test. Exact symmetry test was used for categorization. P <0.05 was considered statistically significant. Grading of AS was adopted from Baumgartner et al. and Nishimura et al. [Table 1]. A total of 60 patients were included in our study. Patient characteristics are summarized in [Table 2]. Mean HR was 75.3/min while performing TTE and 82.0.8/min while performing TEE. Mean systolic BP (SBP) was 124.5 while doing TTE and 113.3 while doing TEE. Although HR was higher and SBP was lower while performing TEE, it was within 20% of TTE values. 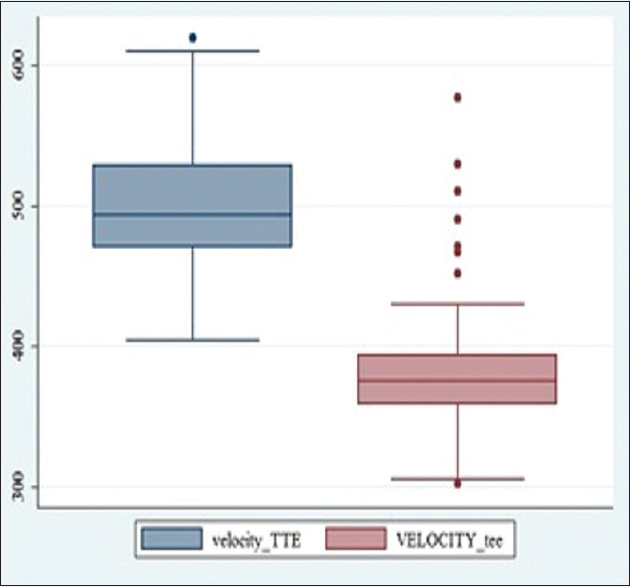 Mean values were obtained for PGm, peak velocity of aortic valve jet, AVA, and DI for TTE and were compared with mean values of TEE. Statistical analysis was done using student paired t-test [Table 3]. Mean value of PGm was 56.4 mmHg in TTE and 39.8 mmHg in TEE. There is statistically significant reduction in PGm. Fifty-nine patients who were graded severe AS due to PGm being >40. In TEE, only 15 patients remained in severe AS due to PGm and rest were moderate. Thus, 74.5% of patients with severe AS were underestimated to have moderate AS in TEE based on PGm. This discordance tested by exact symmetry test was statistically significant [Figure 1]. Peak velocity of aortic valve jet was 500 cm/s in TTE compared to 386 cm/s in TEE. This reduction was statistically significant. Of 60 patients who had severe AS according to jet velocity by TTE only 14 patients remained in severe category in TEE. In 76% of patients, who were graded as severe in TTE, grading of AS reduced to moderate in TEE based on jet velocity [Figure 2]. AVA mean by TTE was 0.67 cm2 and with TEE it was 0.69 cm2. Although there was 0.02 cm2 increase in valve area, it was not statistically significant (P = 0.07). All 60 patients graded as severe AS by AVA in TTE remained as severe AS in TEE as well. Thus, there was no disparity [Figure 3]. DI had a mean of 0.19 in both TTE and TTE imaging. Fifty-seven patients had severe AS according to DI by TTE imaging while 54 patients remained as severe AS according to DI by TEE. Thus, 6% of patients with severe AS were wrongly graded as moderate in TEE, and it was not statistically significant with P = 0.14 [Figure 4]. Our study was conducted on 60 patients with severe AS. Out of them, 54 patients underwent AVR and rest six patients underwent CABG with AVR. In our study, the mean age was 61 years which was younger in comparison with western literature as per the study done by Gamaza-Chulián et al. The most common cause of AS was degenerative (50%) followed by bicuspid aortic valve (BAV) (36%). In a study done by Gamaza-Chulián et al. mean age of patients with AS was 77 years and their most common cause was degenerative (92%). In a study done in the Indian population, degenerative calcification was found to be the most common cause (65.0%) followed by BAV (33.9%), and their maximum patients were in 60–69 years of age gap. Hence, our study is in concurrence of observations with regards to studies done at other Indian centers but in discordance with western studies. From our study, we have found that PGm across aortic valve as well as the jet velocity were less in TEE imaging compared to TTE [Table 3]. Uda et al. have found that intraoperative TEE peak velocity and PGm were lower in 81.2% and 84.6% patients, respectively, compared with preoperative TTE measurements. These findings were similar to the results obtained in our study. The transvalvular flow depends on preload, afterload, left ventricular diastolic compliance, and HR. Influence of general anesthesia, positive pressure ventilation, surgical manipulations, and hemodynamic changes may contribute to lower transvalvular flow and hence lower PGm and jet velocity in TEE (P < 0.01). AVA based on continuity equation has been found to be comparable between TTE and TEE with a nonsignificant increase of 0.2 cm2. Whitener et al. in their study found that AVA increased from mean area of 0.73 in TTE to 0.83 in TEE with P = 0.001. This was contrary to the results obtained in our study. Reduction in grading was found in 14% of cases. Their study was retrospective, where TTE and TEE were done by different examiners. This could have led to a disparity in LVOT measurement. A study done on canine hearts has found that AVA by continuity equation to be flow dependent. However, this was in cases of asymptomatic AS with thickened valves. This may not be true in cases of severe AS with calcification where AVA may not increase with flow. LVOT measurements may be subject to errors but accurate reproducibility while comparing TTE and TEE have been found. DI was found to be comparable between TTE and TEE in our study with a mean of 0.19. Similar results were obtained by Uda et al. Mean DI was 0.2 in both TTE and TEE in their study which is in concordance with our study. DI being flow independent is less subjective to changes due to loading conditions of heart. It does not need LVOT diameter measurement and thus lowers the chances of erroneous measurement. DI is a reliable marker of AS severity. We have taken into account only severe AS where due to extensive calcification AVA may not increase with flow. This might not be the true in patients of moderate AS. Thickened aortic valve leaflets and LVOT may increase in size with increased flow and AVA by continuity also may increase. In this subset of AS, even AVA may be overestimated by TEE. Our results may also be confounded by the fact that we have excluded patients with left ventricular dysfunction and arrhythmias. Peak aortic jet velocity and PGm across aortic valve reduced significantly while performing intraoperative TEE and led to an underestimation of AS in more than 75% of our patients. Our study shows that AVA measurement by continuity equation and DI are reliable in grading AS while performing intraoperative TEE. Other parameters such as PGm and peak velocity across aortic valve should be interpreted with caution for clinical decision making. American Society of Anesthesiologists and Society of Cardiovascular Anesthesiologists Task Force on Transesophageal Echocardiography. Practice guidelines for perioperative transesophageal echocardiography. An updated report by the American Society of Anesthesiologists and the Society of Cardiovascular Anesthesiologists Task Force on transesophageal echocardiography. Anesthesiology 2010;112:1084-96. Kihara C, Murata K, Wada Y, Hadano Y, Ohyama R, Okuda S, et al. Impact of intraoperative transesophageal echocardiography in cardiac and thoracic aortic surgery: Experience in 1011 cases. J Cardiol 2009;54:282-8. Eltzschig HK, Rosenberger P, Löffler M, Fox JA, Aranki SF, Shernan SK, et al. 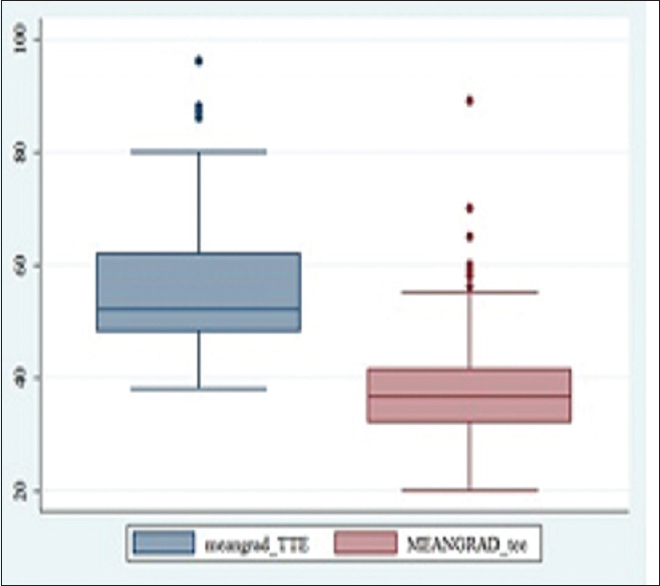 Impact of intraoperative transesophageal echocardiography on surgical decisions in 12,566 patients undergoing cardiac surgery. Ann Thorac Surg 2008;85:845-52. Manjunath CN, Srinivas P, Ravindranath KS, Dhanalakshmi C. Incidence and patterns of valvular heart disease in a tertiary care high-volume cardiac center: A single center experience. Indian Heart J 2014;66:320-6. American College of Cardiology/American Heart Association Task Force on Practice Guidelines, Society of Cardiovascular Anesthesiologists, Society for Cardiovascular Angiography and Interventions, Society of Thoracic Surgeons, Bonow RO, Carabello BA, et al. ACC/AHA 2006 guidelines for the management of patients with valvular heart disease: A report of the American College of Cardiology/American Heart Association Task Force on practice guidelines (Writing Committee to Revise the 1998 Guidelines for the Management of Patients with Valvular Heart Disease): Developed in collaboration with the Society of Cardiovascular Anesthesiologists: Endorsed by the Society for Cardiovascular Angiography and Interventions and the Society of Thoracic Surgeons. Circulation 2006;114:e84-231. Whitener G, McKenzie J, Akushevich I, White WD, Dhakal IB, Nicoara A, et al. Discordance in grading methods of aortic stenosis by pre-cardiopulmonary bypass transesophageal echocardiography. Anesth Analg 2016;122:953-8. Whitener G, Sivak J, Akushevich I, Samad Z, Swaminathan M. Grading aortic stenosis with mean gradient and aortic valve area: A comparison between preoperative transthoracic and precardiopulmonary bypass transesophageal echocardiography. J Cardiothorac Vasc Anesth 2016;30:1254-9. Nishimura RA, Otto CM, Bonow RO, Carabello BA, Erwin JP 3rd, Guyton RA, et al. 2014 AHA/ACC guideline for the management of patients with valvular heart disease: A report of the American College of Cardiology/American Heart Association Task Force on practice guidelines. Circulation 2014;129:e521-643. Baumgartner H, Hung J, Bermejo J, Chambers JB, Evangelista A, Griffin BP, et al. Echocardiographic assessment of valve stenosis: EAE/ASE recommendations for clinical practice. J Am Soc Echocardiogr 2009;22:1-23. Gamaza-Chulián S, Camacho-Freire S, Toro-Cebada R, Giráldez-Valpuesta A, Benezet-Mazuecos J, Vargas-Machuca JC, et al. Ratio of acceleration time to ejection time for assessing aortic stenosis severity. Echocardiography 2015;32:1754-61. Uda Y, Cowie B, Kluger R. Comparison of preoperative and intraoperative assessment of aortic stenosis severity by echocardiography. Br J Anaesth 2017;118:699-704. Burwash IG, Thomas DD, Sadahiro M, Pearlman AS, Verrier ED, Thomas R, et al. Dependence of gorlin formula and continuity equation valve areas on transvalvular volume flow rate in valvular aortic stenosis. Circulation 1994;89:827-35. Accuracy and Reproducibility of Left Ventricular Outflow Tract Diameter Measurement Using Transthoracic When Compared with Transesophageal Echocardiography in Systole and Diastole European Heart Journal-Cardiovascular Imaging Oxford Academic. Available from: https://www.academic.oup.com/ehjcimaging/article/10/2/319/2399593. [Last accessed on 2017 Dec 25]. Rusinaru D, Malaquin D, Maréchaux S, Debry N, Tribouilloy C. Relation of dimensionless index to long-term outcome in aortic stenosis with preserved LVEF. JACC Cardiovasc Imaging 2015;8:766-75.